Most of us are aware that adding insulation to our home’s walls, roof, and attic essential in reducing energy usage and associated costs. But, the insulation materials we choose can also have a direct impact on the environment as well as on our home’s indoor air quality. There is much more to insulation than its R-value (how efficient the material is at preventing heat transfer). For example, where does the material come from? Do you need special equipment to install or handle it? How does it deal with moisture, impact air quality, and insulate over time? Most of us are familiar with the pink ‘cotton candy’ fiberglass insulation in modern homes or rock wool/slag in older homes. But, you might not have heard about wool as insulation. Havelock Wool has caught on to the need for an all-natural, sustainable, and renewable source of insulation that also helps to protect indoor air quality. Sourced from sheep in New Zealand, Havelock Wool is providing the green building industry with a truly eco-friendly alternative. Available in both batt and blow-in insulation, the R values – at 3.6 per inch and 4.3 per inch, respectively – equal or outperform their synthetic counterparts. The US insulation market is continually dominated by products that are either not good for us or are mildly better than those we have become accustomed to using. In either case, there is now a viable alternative that is based on one simple reality: the extremely high integrity of a wool fiber. Sheep’s wool is the perfect natural insulator – just look how well it works for sheep! It is also one of the most environmentally sound solutions for insulating your home, providing strong thermal (and acoustic) insulating properties. 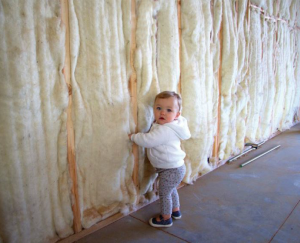 Because it is a natural fiber, wool insulation requires no special protective gear when being installed, and doesn’t off-gas toxic chemicals that can cause respiratory and related health symptoms. Not by coincidence, wool insulation has some amazing properties, including inherently regulating temperature and moisture. In fact, it excels at managing moisture against as much as 65% relative humidity, which is a major contributor to its durability and longevity. Moisture works against most other types of insulation, potentially leading to the growth of mold, which can result in health issues and costly repairs. Wool insulation also irreversibly bonds with formaldehyde, nitrogen oxide, and sulfur dioxide – trapping and removing them to “clean” the air inside your home. LONG LASTING – With an extensive useful life, wool retains its volume and shape compared to conventional materials and does not lose its R-value over time due to settling or moisture. Havelock Wool insulation is available for remodels or new construction as loose fill or in batts. Check out www.havelockwool.com for more information.